Q&A: Embryonic Stem Cells: Exploding the Myths When it comes to embryonic stem cells, you can find just about any opinion you like: They are an untapped elixir of life; they will lead to embryo "farms" where potential lives are snuffed out; they will cure all diseases; their potential is overhyped. Joe Palca looks at the facts and fictions behind stem-cell science. 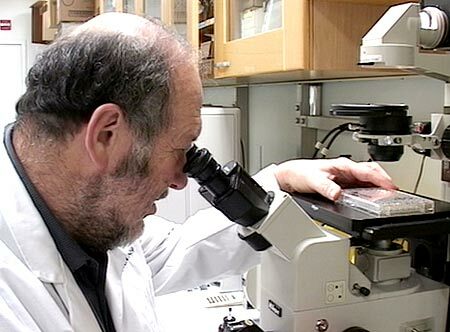 Dr. Irving Weissman looks into a microscope at the Stanford University Cancer and Stem Cell Biology Institute in Stanford, Calif. Stanford has received six grants, worth $15 million, from the California Institute of Regenerative Medicine for stem-cell research. Will embryonic stem cells cure diseases? The excitement about the potential of embryonic stem cells to cure disease comes from their unique potential to turn into any cell type in the body. There are many diseases that are caused when a particular cell type in the body starts behaving badly. Take diabetes. 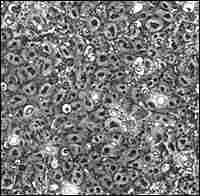 The disease occurs when special cells in the pancreas, called islet cells, stop making insulin. Another example is Parkinson's disease, which occurs when neurons in the brain that make a chemical called dopamine are selectively destroyed. The idea is that embryonic stem cells could be grown in great quantities in the laboratory. The cells would then be coaxed into becoming islet cells to treat diabetics, or into dopamine-producing neurons that could be transplanted into Parkinson's patients, replacing those destroyed by disease. That's the theory. In practice, no one has tried it in humans. And there have only been sporadic attempts using animals. Many scientists are convinced this approach will work eventually, but their optimism, at this point, is driven by theory. Alzheimer's disease is frequently mentioned as one that might be cured by stem-cell therapy, but most neuroscientists think this is unlikely. It does not appear to be a disease caused by damage to a particular cell, so cell therapy probably wouldn't be the most appropriate treatment. Can adult stem cells do everything embryonic stem cells do, but without controversy? All stem cells have certain capabilities. They can divide and renew themselves for long periods; they are unspecialized (which means they are not a specific type of cell); and they have the ability to give rise to specialized cells. Embryonic stem cells are obtained from human embryos. They have the capacity to turn into any cell type in the body. Adult stem cells have been found in some mature human tissues, including the brain and bone marrow. There is a scientific debate over whether their ability to become specialized is limited to their tissue of origin, or whether they can turn into other types of tissue. Adult stem cells have proven their value to medicine. For example, bone marrow transplants are routinely used to treat some cancers and blood diseases. But it's unlikely that bone marrow stem cells can replace all of the different types of cells that are damaged by disease. Embryonic stem cells are the only ones that are likely to do that. 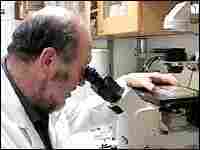 Critics of embryonic stem-cell research say those cells have never cured anyone. Is that true? Transplanting a kidney never cured anybody until someone had the idea of trying it, and then worked out the regimen that would prevent a transplanted kidney from being rejected by its grateful recipient. The proper way to phrase the statement is "embryonic stem cells haven't cured anybody yet." Is it necessary to destroy an embryo to obtain embryonic stem cells? To derive embryonic stem cells, it is necessary to take critical cells out of the embryo. What is left no longer has the capacity to produce a baby if transplanted into a uterus. Critics of embryonic stem-cell research say the destruction of an embryo is murder. Whether it is or not is a social and ethical question, not a scientific one. Several teams of scientists are working on methods to create embryonic stem cells without destroying an embryo. Although the work is promising, success is most likely many years off, if it is ever achieved. In 2006, the Massachusetts biotech company Advanced Cell Technology showed that it may be possible to remove a single cell from an embryo created by IVF before the embryo is transferred into a woman. That single cell could then be used to derive embryonic stem cells. If the federal government doesn't expand funding for embryonic stem cells, will U.S. scientists flee to other countries? A few top scientists have left, but there is no evidence of a wholesale exodus. If there is any fleeing going on, it is to California because of the California Institute for Regenerative Medicine (CIRM). That's the state agency that will decide how to spend the $3 billion that California voters approved for stem-cell research. So far, however, lawsuits filed by taxpayer advocates and anti-abortion rights groups have prevented the agency from selling the bonds needed to raise the $3 billion. But the agency has managed to raise interim funding from philanthropists, and combined with a $150 million state loan approved by Gov. Arnold Schwarzenegger, the agency has been able to issue grants worth about $120 million. California research institutions, such as UCSF, Berkeley and USC, meanwhile, aren't waiting for state money; they have received tens of millions of dollars in pledges from private donors. Given the diffcult funding climate, does America run the risk of falling behind in stem-cell research? On Aug. 9, 2001, President Bush said federal money could only be spent for research on about 60 lines that had been created prior to that date, where the "life-and-death" decision about the embryos used to create those lines had already been made. In reality, less than a dozen of the 60 lines have become widely available to scientists, and therefore eligible for federal funds. Other countries have taken a very different approach. For example, the United Kingdom and Singapore have stated that stem-cell research is a national priority, and have been spending money freely on this research. Are U.S. scientists prohibited from doing certain kinds of embryonic stem-cell research? There are virtually no restrictions on the kind of stem-cell research that may be done in this country. The federal restrictions are on the use of federal dollars for embryonic stem-cell research. With private money, scientists can do practically anything they want. That said, the federal funding restrictions do create problems for scientists. Most academic institutions receive some federal money, and it requires scrupulous accounting. In some cases, university researchers must use separate facilities that are off-campus if they want to work on any stem-cell lines not approved for federal funding. Some scientists are using cloning techniques to obtain embryonic stem cells. Is the cloning technique to make stem cells the same as the cloning technique to make a baby? Yes and no. The process starts out the same in both scenarios. The nucleus of an adult cell is inserted into an egg from which the DNA has been removed. The egg is then coaxed to start dividing, becoming an embryo. But here the similarities end. In cloning to make stem cells, scientists let the embryo grow in the lab until it turns into a hollow ball of about 100 cells. They then remove special cells from the interior of this ball, and transfer them to a laboratory dish. After certain nutrients and other ingredients are added, these cells will become an embryonic stem-cell line. If the cloning technique were used to make a baby, doctors would transfer the embryo to a woman's uterus well before it had grown to the 100-cell stage. If implanted, it's possible that embryo could be carried to term and produce a child that would be the clone of the adult-cell donor (though no one has succeeded — that we know of). It is not illegal in the United States, although the U.S. Food and Drug Administration has asserted that anyone planning to try it would first have to get FDA approval.